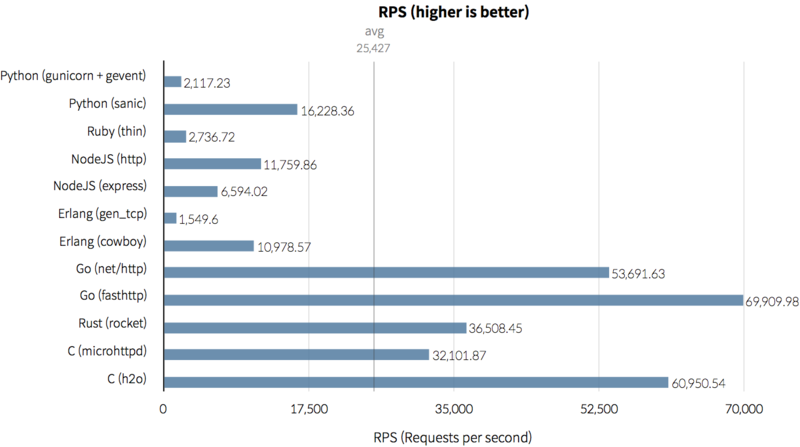 This is a benchmark with comparative of performance of various well known web servers. Web servers these days are fast enough, and I think not many people opt for the fastest web server, but instead are interested in that. So I made a simple benchmark to see which approach gives the best result. This test only covers basic "Hello World"(11 chars) response performance over the HTTP/1.1 protocol for different languages and http server implementations of it. Server and client were running on the same machine. They used all these same cores and memory quota, but it's just as clearly not a huge problem. Important note that this benchmarking here was primarily for fun, not science. I used the simple HTTP benchmarking tool wrk — agree with some of you may be saying "not the ideal tool" but it's good enough here. Command used to run benchmarks was wrk -t 4 -c 1000 -d 10s. I've focused on general usage, this means except for multicore languages, I didn't specify how many CPU cores to use. So performance will probably get better if it is used, but it's not as good as you think. Even though sinatra itself supplies a web server and is often considered as the de-facto web server, it is not for production. receive Any -> io:format("~p~n", [Any]) end. %% to stop: ehttpd!stop. Note that tokio-minihttp is an alpha quality implementation and not built for production. I was quite surprised by the result, and tried it a few more times as I think something might be wrong. I never thought C would lose it and Go would win. Also, I didn't expect Python to get a good result even with asyncio + uvloop. node.js is the most famous event-driven runtime, but it's slower than Python with asyncio and uvloop in this benchmark. this, however, does not mean that python is better than node.js. 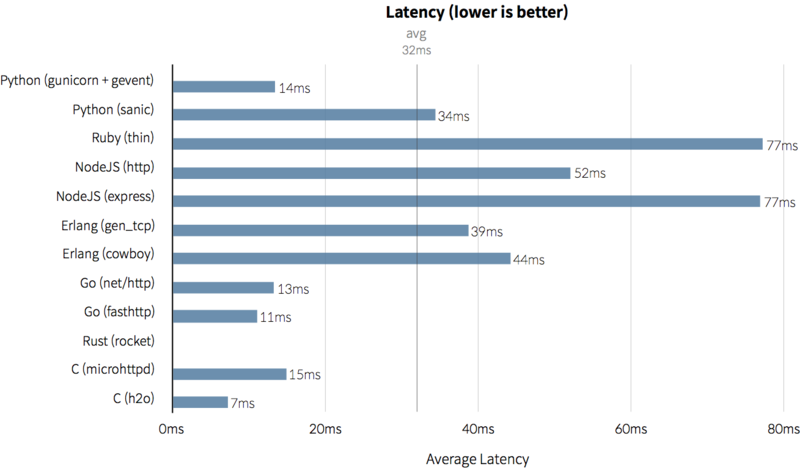 the default performance of Go is quite impressive and promising, it is very close to C.
Please keep in mind that this benchmarking does not represent the real performance, and I hope you enjoyed these benchmarks.